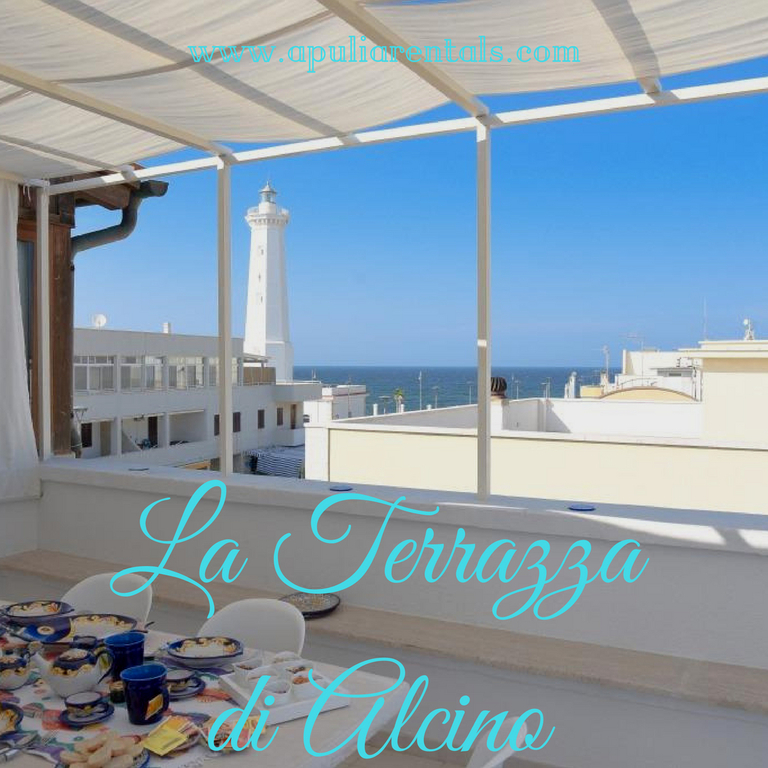 The apartment La Terrazza di Alcino for rent is situated in the middle of Torre Canne and is suitable for all those who want to escape the stressful everyday life and experience southern Italian flair up close. It has, on the second floor of a typical Italian house, a living-dining room with sofa bed, a very well equipped kitchen, 2 bedrooms (one with a double bed and one with 2 single beds) and 2 bathrooms and offers space for 6 persons. Other facilities include cable TV, air conditioning, wifi and a baby cot as well as a high chair for the little guests. The highlight of the accommodation is the large, lovingly decorated terrace with a view of the Mediterranean Sea, which invites you to linger. A selection of supermarkets, restaurants and bars can be found within 7 minutes' walk or 500 metres. The beach Spiaggia di Torre Canne can be reached on foot in 2 minutes. A garage is available for your car. Pets are allowed (on request, at extra charge). Bed linen and towels are included in the price. Linen and Towels; 4 Gas Cookers; Frindge; Garden Furniture; TV, air conditioning, washingmachine, internet wi fi.